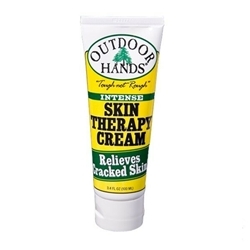 Outdoor Hands is a dramatic new hand cream developed by a clinical pharmacist for his family, patients and medical associates when no other creams were effective in treating their cracked, chapped and dry hands. It contains an effective blend of certified organic oils and botanical extracts for superior healing and moisturizing. Because it contains no mineral oils or petrolatum, it is quickly and fully absorbed by the skin, leaving hands feeling soothed and refreshed with no greasy residue. That’s 6 skin therapy cream tubes for $50 ($8.33 per tube)! What a steal!